While USDCAD is falling down the long term descendant channel there won’t be any economic news in Canada to influence this trend. The only effective news factor is the nation’s GDP data for February which will be released tomorrow. USDCAD will move in bearish bias creating lower highs and lower lows. 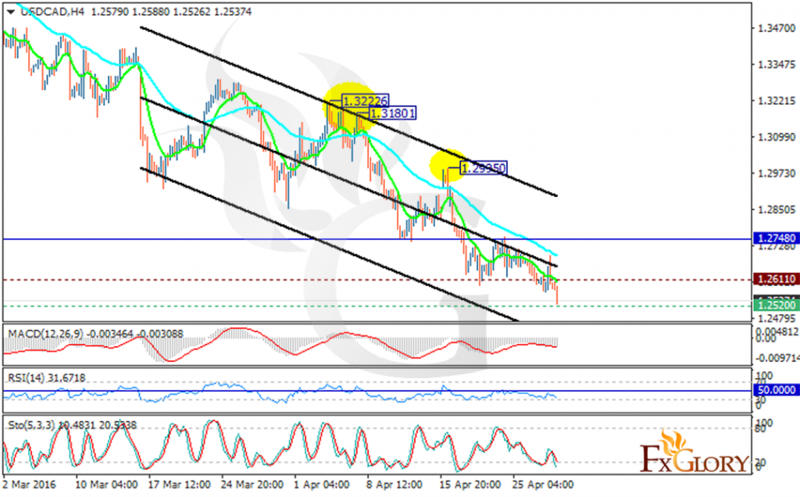 Now the support resides at 1.25200 with resistance at 1.26110 which both lines are below the weekly pivot point at 1.27480. The MACD indicator is in negative territory showing the price decline and the RSI confirms this by being below the 50 level. Moreover the stochastic is showing downward trend as well. The EMA of 10 is falling along with the EMA of 50 which is located above it. The support level breakthrough is a good sign for sellers to trade in lower ranges.